Will the Supreme Court Reconsider Citizens-United? 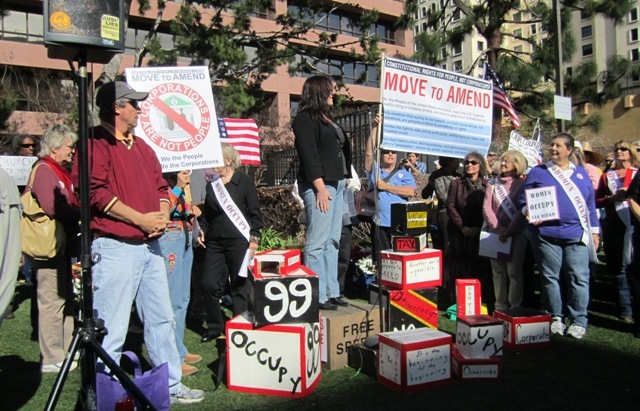 San Diegans rally against "Citizens United" on Jan. 20, 2012, in downtown. Is there really a chance that the Supreme Court might reconsider Citizens United? A week ago, I wouldn’t have thought so, and I still think it’s an extreme long shot. But a provocative statement last Friday by Justices Ruth Bader Ginsburg and Stephen G. Breyer makes this crazy idea worth pondering – which is undoubtedly what the two justices intended. Their three sentences were attached to an order issued by the full court granting a stay in a case from Montana on the right of corporations to make independent political expenditures. We all know, from the Citizens United decision two years ago, that corporations have a robust First Amendment right to spend as much as they want on politics, a right they are exercising to the hilt in the current election season. However, the Montana Supreme Court saw things quite differently in a decision it issued two months ago. Voting 5 to 2, the state court rejected a constitutional challenge to a century-old Montana law that bans corporate political contributions and expenditures unless made through a tightly circumscribed political action committee. This history led Montana voters to adopt the corporate ban by referendum in 1912. The state’s lasting vulnerability “to continued efforts of corporate control to the detriment of democracy,” the state Supreme Court said, provides the “compelling interest” that makes the law constitutional today. Unsurprisingly, James Bopp Jr., the lawyer who represented Citizens United and who now represents the three non-profit corporations challenging the Montana law, asked the justices in Washington for a stay while he could prepare a formal appeal, which he suggested would be a mere formality. “The lower court’s refusal to follow Citizens United is such an obvious, blatant disregard of its duty to follow this court’s decisions that summary reversal is proper,” Mr. Bopp wrote in the introduction to his 36-page stay application in American Tradition Partnership Inc. v. Bullock. The justices didn’t take up the lawyer’s invitation to simply overturn the state court ruling, at least not now, but they did grant the stay, without any noted dissents. In their separate statement, Justices Ginsburg and Breyer seemed not to buy the “Montana is different” rationale, instead viewing the state court’s ruling, despite its protestations to the contrary, as simple defiance of Citizens United. “Lower courts are bound to follow this court’s decisions until they are withdrawn or modified,” the two justices observed. That would be a huge leap for the Citizens United majority – which included neither Justices Ginsburg nor Breyer. Justice Anthony M. Kennedy, who wrote the decision, and the four justices who joined him are all still on the court, while three of the four dissenters remain: Justices Ginsburg, Breyer and Sonia Sotomayor. Furthermore, their reference in their statement to “corruption or the appearance of corruption” lacks the full context in which the majority suggested that proof of either could provide the requisite justification for limiting corporate speech. Justice Kennedy’s opinion made clear that the majority was talking about corruption in a very particular sense, specifically “quid pro quo corruption,” defined as “dollars for political favors.” Justice Kennedy went on to say that “the fact that speakers may have influence over or access to elected officials does not mean that these officials are corrupt.” In other words, to find a compelling interest in limiting corporate political spending, the Citizens United majority wants to see proof that huge corporate expenditures are not only queasy-making but indictable. Nonetheless, Justices Ginsburg and Breyer are savvy players, and their statement, gratuitous as a legal matter, has to be taken as strategic. So what was the strategy? To keep the public conversation going? To encourage a broader pushback? To induce Justice Kennedy to re-examine his basic assumptions in light of what’s happened since the day in January 2010 when Citizens United burst upon the political landscape? All of the above? No one likes to admit a mistake, and being a Supreme Court justice means never having to say you’re sorry – or almost never. True, the court reversed itself on gay rights in the 2003 Lawrence v. Texas decision, but three of the five justices comprising the anti-gay rights majority 17 years earlier in Bowers v. Hardwick had left the court. Repudiations of precedent are nearly always the result of a change in membership rather than a change in perception. More directly relevant, I think, is one of the most fascinating episodes in Supreme Court history, the court’s rapid reversal during the early 1940s on the question of whether Jehovah’s Witness children had a constitutional right to refuse to salute the flag. Only three years separated the 8-to-1 decision in Minersville School District v. Gobitis, in which the court held that “national cohesion” justified requiring the patriotic gesture by schoolchildren whose religion forbade it, from West Virginia State Board of Education v. Barnette, which upheld the children’s right under the First Amendment to “differ as to things that touch the heart of the existing order.” The second decision, with a majority opinion by Justice Robert H. Jackson, is one of the most eloquent endorsements of free expression the court has ever issued. The vote was 6 to 3. What happened? Two members of the new majority, Justice Jackson and Justice Wiley B. Rutledge, had joined the court since the Gobitis decision. But three others – Justice Hugo L. Black, William O. Douglas, and Frank Murphy – simply changed their minds. The first decision, issued as World War II was raging in Europe, was widely, if mistakenly, viewed as an official labeling of Jehovah’s Witnesses as traitors. Mobs burned down the religion’s Kingdom Halls, and thousands of children were expelled from schools around the country. Children were beaten and bullied. Recounting these events, Professor Douglas E. Abrams of the University of Missouri Law School wrote recently that “the intensity of the post-Gobitis brutality surprised and likely shocked justices who had not anticipated such a bloody backlash against the small, peaceable religious group that had summoned their protection.” The court’s about-face was widely hailed. “Blot Removed” was the headline that Time magazine – hardly a liberal organ in the 1940s – put on its report of the second decision. I have no idea whether Justices Ginsburg and Breyer had the flag-salute cases in mind when they called on the court last week to take account of the real-world impact of Citizens United. For all I know, Justice Kennedy, a wordsmith in his own right, regards his Citizens United opinion as the most ringing endorsement of free expression he has ever written. If so, then the Ginsburg and Breyer statement will have no greater effect than the thwarted effort by members of the Occupy movement to claim the Supreme Court’s plaza on the decision’s second anniversary last month. As I said, a long shot, but an intriguing one. And no matter what the justices do next about Citizens United and the Montana Supreme Court, the conservative members of the court have their own do-over target. The court’s decision this week to hear a constitutional challenge to the affirmative-action admissions plan at the University of Texas raises the unmistakable prospect that diversity as a rationale for taking race into account in higher education will soon be history. It’s nine years since the court, in Justice Sandra Day O’Connor’s majority opinion in Grutter v. Bollinger, upheld a race-conscious admissions plan at the University of Michigan Law School and declared that affirmative action had 25 more years to run. The crucial date, it turns out, proves to have arrived rather sooner: Jan. 31, 2006, when Justice O’Connor left the court and Justice Samuel A. Alito Jr. took her place. Since then, the Roberts court has bided its time, waiting for the right case. The do-over season has dawned. Go here for the article at RSN and for more links.